Make the Mole Coloradito. On an ungreased griddle or heavy skillet heated over medium, toast the chiles a few at a time: open chiles flat, lay on the hot surface, press flat for a few seconds with a metal spatula (until they start to crackle, even send up a faint wisp of smoke), then flip and press down to toast the other side. In a medium-size bowl, cover the chiles with hot water and let rehydrate 30 minutes, stirring frequently to ensure even soaking. Drain and discard the water. While the chiles are soaking, lay a piece of foil over part of your hot griddle or skillet and lay the tomatoes on it; on the uncovered part, place the garlic. Roast, turning everything occasionally, until blackened in spots and soft, 10 to 15 minutes. Cool slightly, then peel off the tomato and garlic skins. On the hot surface, toast the sesame seeds for a minute or so (they’ll pop around), then scrape them into a blender along with the tomatoes and garlic. Add the chiles, cinnamon, oregano, pepper, chocolate and 1 1/2 cups of the broth. Blend to a smooth puree, then press through a medium-mesh strainer into a bowl. Heat the oil or lard in a heavy, medium-size (2- to 3-quart) saucepan over medium-high. When hot enough to make a drop of the puree sizzle fiercely, add the puree all at once and stir for several minutes as it sears and thickens. Stir in another 1 1/2 cups of the broth, partially cover and simmer for about 1 hour, stirring occasionally. Taste and season highly with the salt, usually about 1 1/2 teaspoons, and the sugar. Turn on the oven to 350 degrees. Spray or brush with oil on one side of the tortillas then stack them up on a baking sheet and slide into the oven for just long enough to soften, about 3 to 4 minutes. In a medium skillet set over medium-low, add the chicken (or one of its stand ins) and ladle in some of the sauce, about 1/2 cup. Lay out the warm tortillas on a counter, top them each with a portion of meat, roll them up and place them on a plate, seam side down. To serve the enchiladas, spoon a generous amount of sauce over the tortillas. Garnish the enchiladas with the topping(s) of your choice: crema, white onion, and cilantro or parsley leaves would be nice here. I made this recipe today and as I always do when I make a recipe for the first time, I followed the recipe to a t. To say that this recipe blew me and my family away would be an understatement. It was amazingly delicious. I made refried beans on the side along with guacamole made using Rick’s spicy quac mix. I made corn tortilla’s from scratch. I use a recipe for corn tortilla’s I got off the New York Times website that always come out perfect. For the part where you blend and press the mixture through a medium strainer – I could not get more than a couple of tablespoons to move through the strainer. I did use a Vitamix which turned the mixture into a very thick and smooth puree. The recipe never said to core and remove the seeds from the tomatoes so I didn’t and it didn’t seem to matter. There were no visable seeds in the sauce and it was not bitter in any way. This was one of those meals where the room is silent for a few minutes followed by oohs and ahhs and then we all agreed it was the best mole we’ve ever had. I do find with Mexican food that choosing good quality ingredients pays off and make sure an give yourself the time to make it (obviously). This recipe is a keeper and I thank Rick Bayless for making this available to all of us for free. 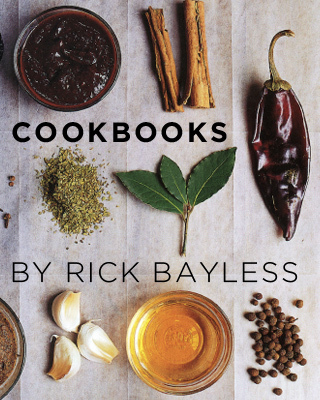 To make you feel good Rick, I do own one of your cookbooks and will probably buy your most recent one. Thanks again. I saw Rick make this on tv, bought all the ingredients and made it today. I’ve not worked with dried chilis before so paid careful attention to them. I used my food scale to weigh the ingredients. I think I did everything right, but the sauce I made is soooo bitter. I tried adding extra sugar, but that didn’t help. The color and consistency are good, but the taste is awful. Can you suggest what I did wrong? Hi Susan!! Did you toast the Chiles first? Also were the chiles flexible when you bought them? Usually the bitterness comes from burning the chiles. I don’t let the chiles sit for more than a few seconds. Once the chiles are scorched there is no saving the sauce. 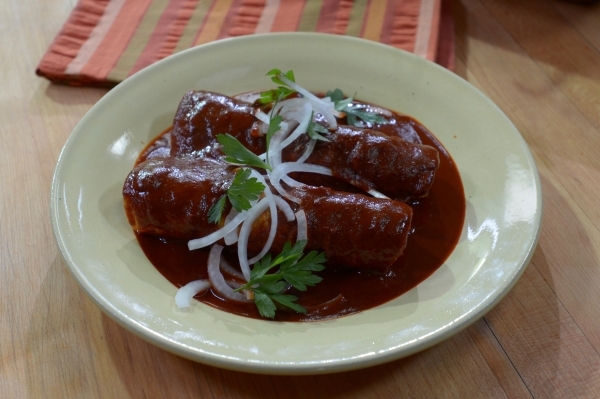 Can I use pork instead of chicken for red mole enchiladas? Yes, pork would be wonderful! Would this hold up with a cheese enchilada or a veggie filling? We have some vegetarians in the family and the sauce sounds fantastic! Yes, we sometimes only use cheese, and veggies at my house! My husband and I made this tonight and is was absolutely fabulous! We used chicken. Thank you Chef Bayless! Note to self. Always read comments before jumping into a recipe. My biggest concern is using a medium mesh, basically didn’t allow most of the sesame seeds to pass the mesh. I no noted that when I did roast the chili’s some may have scorched a little bit, so I am anxious to see if the sauce is really bitter or not. I hope not since there is some serious time involved with this recipe. I have a pretty trusty Cuisinart processor. We shall see. great recipe. I was a hero later night. What type of cheese could I use in this recipe? Jack cheese is always good with this recipe or you could garnish with a queso fresco or anejo. Blending sesame seeds never works out for me. They just stay suspended in the liquid, then when I stain it they’re all now in the stainer. Regardless, you’re probably still going to find a lot of the hull from the seeds leftover in the strainer.